The bitter irony of the film franchise unofficially called DC Extended Universe is that most of its star players have been throwing up bricks while those initially thought of as backups have been slamming it home. 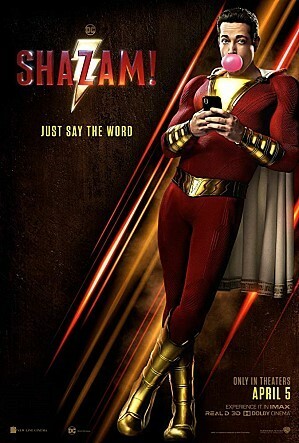 It is now up to “Shazam!” a superhero film based on a character of the same name, to pump life into DC in what has been a losing battle against the far more successful Marvel Cinematic Universe. Warner Bros. Korea on Tuesday announced the new comic book-based film will be released here in early April. The release is likely to be around the US release date of April 5, as most DC and MCU film releases in Korea have typically been one or two days ahead of those in the US. What makes the film about a child turning into a sorcery-wielding superhero significant is that “Shazam!” is the only DCEU flick that will be released this year, after the release of “Wonder Woman 1984” was pushed back from November to next year. “Joker,” based on the iconic DC villain of the same name, is not part of the shared universe. This means another flop for the studio may be a nail in the coffin in the one-sided war between DCEU and MUC. DCEU has been struggling to turn its hugely popular comic book characters into successful films. After “Man of Steel” in 2013 was commercially successful but received mixed reviews, the franchise pitted its two most popular heroes against each other in “Batman v Superman: Dawn of Justice” in 2016, only to again garner not-so-favorable responses from fans and critics. “Suicide Squad,” which gathered DC’s best-known villains, received even worse reviews. Still, these films managed to make a ton of money. However, the franchise’s reputation tanked the following year with what was supposed to be its crown jewel. “Justice League” -- which saw the teaming up of its most popular superheroes -- was DC’s equivalent of Marvel’s “Avengers” series and was expected to become its biggest hit. With a whopping $300 million budget, it remains by far the most expensive DC film to date and one of the priciest films ever made. Contrary to expectations, it was a critical flop and box office bomb, becoming the lowest-grossing DCEU film of all time and actually losing the studio close to $100 million. Late last year, DCEU received an unexpected boost when “Aquaman,” based on one of DC’s less popular heroes, became its first to crack the $1 billion mark at worldwide box offices. The franchise, however, has a long way to go to catch up with MCU. MCU currently has six films that have raked in over $1 billion, including “Avengers: Infinity War,” which made over $2 billion and is the fourth highest-grossing film of all time. Buoyed by its success, Marvel Studios is set to release three MCU movies this year, starting with “Captain Marvel” this week and ending with “Spider-Man: Far From Home” in July. “Avengers: Endgame” the fourth installment of the “Avengers” series that is to be released next month, is widely expected to be a massive hit, as even the least of its predecessors made $1.4 billion. While critics and fans alike agree that DC badly needs a success to stay relevant, it is unlikely that “Shazam!” will close the gap. Early projections by analysts place the David F. Sandberg film’s opening US box office tally at around $50 million, while projections for the “Endgame” opening figure sit north of $250 million.